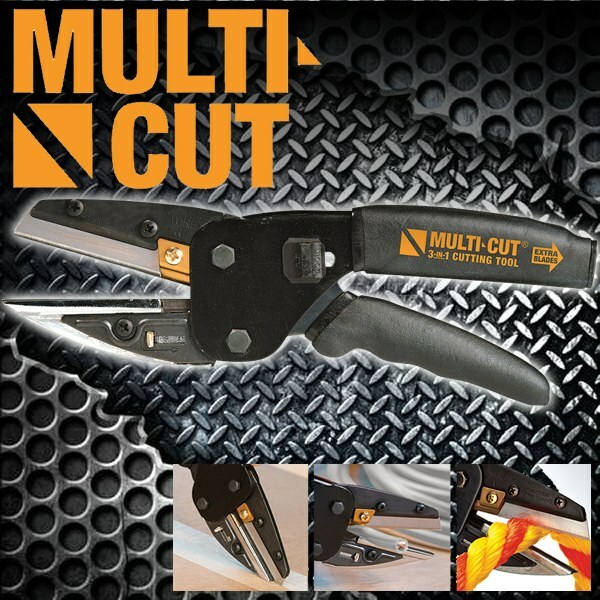 Multi-Cut 3-in-1 cutting tool is the most versatile cutter that combines a powerful cutter, utility knife and wire cutter in one. Now you can cut the tough, ridged material easily. The powerful cutter cuts through thick and rigid material with ease. The retractable utility knife is perfect for opening boxes, cutting drywall, carpet and more. The titanium cutter effortlessly cuts copper, aluminum and steel wire. The razor-sharp blade and offset pivot point give you incredible cutting power. The protrudes forward converting it into a utility knife. Replacement blades store in the comfort ergo-grip handle. Safety lock assures the tool stays closed when not in use. Heavy duty construction. As seen on TV Multi-Cut 3-in-1 cutting tool is the most powerful tool to fit in the palm of your hand. 10". Been using this awesome cutting tool almost every day.